Dagobert II (Latin: Dagober(c)tus; Old English: Dægberht; died 679) was the Merovingian king of the Franks ruling in Austrasia from 675 or 676 until his death. He is one of the more obscure Merovingians. He has been considered a martyr since at least the ninth century. According to the Book of the History of the Franks, which dates to 727, after Sigebert's death, Grimoald, the mayor of the palace and thus the most powerful official under the king, arranged for Dagobert to be tonsured and placed in the custody of Dido, bishop of Poitiers. Tonsuring rendered Dagobert unfit for the throne, since Merovingian kings always wore their hair long. Dido then sent Dagobert to Ireland. The dating of these events is uncertain. They are usually placed in 656, but a date as early as 651 has also been proposed. No contemporary source describes Dagobert's time in Ireland. The eighteenth-century antiquary Mervyn Archdall was the first to record the association of Dagobert with a specific place in Ireland. He wrote that an local oral tradition current at that time put Dagobert in the monastery of Slane, a conclusion accepted by some modern scholars. Dagobert's reign is sparsely recorded. The Book of the History of the Franks, which has a Neustrian perspective, does not mention him again after describing his exile. The historian Richard Gerberding says of the History's author, "Either he did not believe that Dagobert had returned to become king or he did not want us to know of it". Only one seventh-century work from within the Merovingian kingdoms, the Life of Abbess Sadalberga of Laon, mentions the reign of Dagobert, and then only in passing. It records that Sadalberga moved her convent from the suburbs of Langres in northern Burgundy to the city of Laon because of forbodings, later proven true by "recent fighting between Kings Dagobert and Theuderic". This is the only mention of a war between Dagobert and his first cousin, Theuderic III of Neustria. It is an indication of the continuing animosity between Ebroin and the Austrasians. That the war was waged deep in Burgundy, which was under Neustrian rule, suggests that Dagobert for a time had the initiative. It may be during this war that Pippin of Herstal and Martin of Laon launched the attack on Theuderic III that was defeated by Ebroin at the famous Battle of Lucofao, resulting in Martin's death. While this battle may have taken place after Dagobert's death, a more likely date is September 679, when Dagobert was still alive to issue orders for the raising of levies. ^ Picard 1991, pp. 43–46. ^ a b c d e f g h Wood 1994, pp. 231–34. ^ Gerberding 1987, p. 79. ^ Gerberding 1987, pp. 79–84. ^ Fouracre & Gerberding 1996, p. 23. Fouracre, Paul J. (2018). "Dagobert II". In Oliver Nicholson (ed.). Oxford Dictionary of Late Antiquity. Vol. 1. Oxford: Oxford University Press. p. 450. Fouracre, Paul J.; Gerberding, Richard A., eds. (1996). 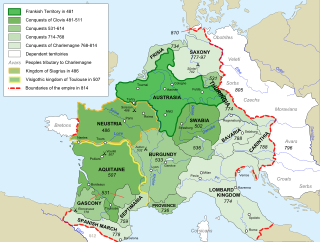 Late Merovingian France: History and Hagiography, 640–720. Manchester: Manchester University Press. Picard, Jean-Michel (1991). "Church and Politics in the Seventh Century: The Irish Exile of King Dagobert II". In Jean-Michel Picard (ed.). Ireland and Northern France, AD 600–850. Dublin: Four Courts. pp. 27–52. Shippey, Tom (2005). "The Merov(ich)ingian Again: damnatio memoriae and the usus scholarum". In K. O'Brien O'Keeffe; Andy Orchard (eds.). Latin Learning and English Lore: Studies in Anglo-Saxon Literature for Michael Lapidge. vol. 1. Toronto: University of Toronto Press. pp. 389–406. Wood, Ian N. (2003). "Deconstructing the Merovingian Family". In Richard Corradini; Maximilian Diesenberger; Helmut Reimitz (eds.). The Construction of Communities in the Early Middle Ages: Texts, Resources and Artefacts. Leiden: Brill. pp. 149–171. Leodegar of Poitiers was a martyred Burgundian Bishop of Autun. He was the son of Saint Sigrada and the brother of Saint Warinus.